LOS ALAMOS, N.M., Oct. 17, 2018–A new collaborative study has investigated Arctic shrub-snow interactions to obtain a better understanding of the far north's tundra and vast permafrost system. Incorporating extensive in situ observations, Los Alamos National Laboratory scientists tested their theories with a novel 3D computer model and confirmed that shrubs can lead to significant degradation of the permafrost layer that has remained frozen for tens of thousands of years. These interactions are driving increases in discharges of fresh water into rivers, lakes and oceans. "The Arctic is actively greening, and shrubs are flourishing across the tundra. As insulating snow accumulates atop tall shrubs, it boosts significant ground warming," said Cathy Wilson, Los Alamos scientist on the project. "If the trend of increasing vegetation across the Arctic continues, we're likely to see a strong increase in permafrost degradation." 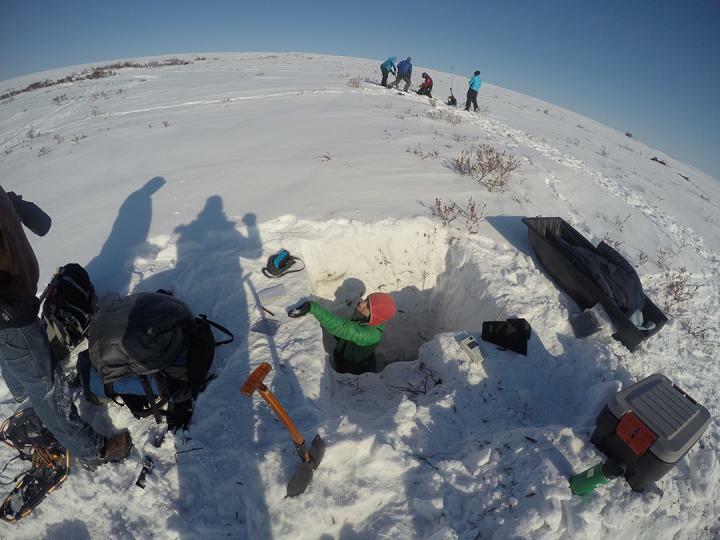 The team investigated interactions among shrubs, permafrost, and subsurface areas called taliks. Taliks are unfrozen ground near permafrost caused by a thermal or hydrological anomaly. Some tunnel-like taliks called "through taliks" extend over thick permafrost layers. The Los Alamos team and collaborators from the Department of Energy (DOE) Office of Science's Next-Generation Ecosystem Experiments Arctic program, which funds this project, used a new Los Alamos-developed fine-scale model, the Advanced Terrestrial Simulator (ATS). It incorporates soil physics and captures permafrost dynamics. The team repeatedly tested results against experimental data from Alaska's Seward Peninsula. "These simulations of through talik formation provide clues as to why we're seeing an increase in winter discharge in the Arctic," said Los Alamos postdoctoral research associate Elchin Jafarov, first author on the paper. This model is the first to show how snow and vegetation interact to impact permafrost hydrology with through talik formation on a slope–prevalent across Alaskan terrain. The team, including collaborators from Oak Ridge National Laboratory and the University of Alaska, investigated how quickly through taliks developed at different permafrost depths, their impact on hydrology and how they interrupted and altered continuous permafrost.